Compare Neato Botvac D3 Connected vs. Botvac D5 Connected: What Are The Differences? Botvac D3 Connected and Botvac D5 Connected are two of Neato's Wi-Fi supporting vacuuming robots that can be controlled with your smartphone and that come with rich feature sets to help you clean easily and thoroughly your floors. Neato Botvac D3 and D5 Connected on Amazon. 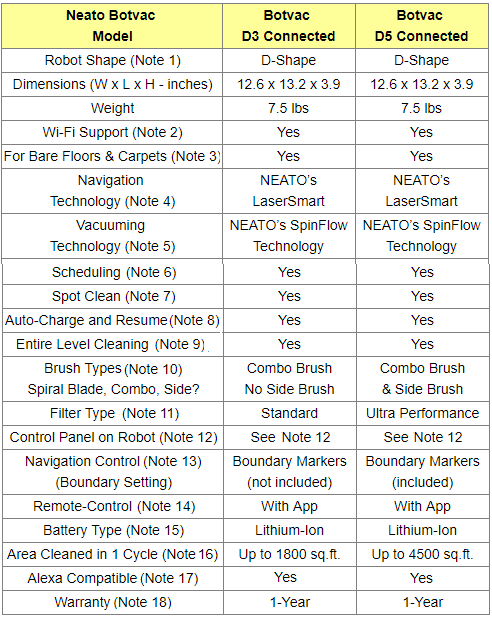 Note: For a comparison of all Neaoto Botvac robots, please click: Comparing All Neato Botvac Robots. Both robots support 2.4Ghz Wi-Fi and can be controlled from your smartphone. If no boundary markers are used at room entrances to prevent the robot from entering, these robots will clean one room after another until the entire level is cleaned. For information on boundary markers, please refer to Note 13 below. Both robots come equipped with a combo brush which combines the cleaning power of blades and bristles and offers superior pickup of pet hair. 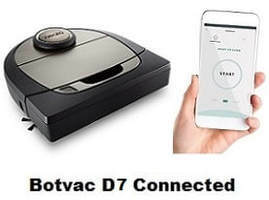 It makes less noise during operation and is ideal for picking up hair from carpeted floors..
Botvac D5 Connected is also equipped with a side brush used for thorough edge cleaning. It allows the robot to get deep into corners and right up against walls as well as base boards for superior cleaning coverage. There is no side brush on Botvac D3 Connected. Botvac D3 Connected comes with a "standard" filter, while Botvac D5 Connected is comes with an "ultra-performance" filter that can capture more than twice the amount of allergens and dust captured by the standard filter. Botvac D3 Connected: 60 minutes. Botvac D5 Connected is also equipped with a side brush to clean better wall edges and corners, Though Botvac D3 Connected does not have a side brush, because the robot is D-shaped, it still can do an acceptable job cleaning wall edges and corners. Botvac D5 Connected comes with an ultra-performance filter as opposed to the standard filter D3 Connected comes with. Clearly, the ultra-performance filter does a better job cleaning the air from allergens and dust. Note that you can optionally buy an ultra-performance filter to replace the filter that comes with the D3 Connected (see Amazon products section below). When these robots are fully charged, D5 Connected can run longer than D3 Connected. Now, if you don't need the additional features that come with D5 Connected, and you want to save some mony, you might want to consider Botvac D3 Connected.